The live-in partner of slain SPO1 Adonis Dumpit remained incredulous over the death and alleged illegal drugs involvement of the controversial cop, questioning the legality of the anti-drug operation which led to his killing. Ma. Ella Amores, 45, who has been Dumpit’s live-in partner for a decade, alleged that the veteran police officer was ambushed, denying allegations that he was involved in illegal drug activities. “Ambush gyud to. Di ko mo-igon na shabu, ambush. Og shabu ang duda, ila nalang diay unta mi gi-ari, ila diay unta mi gi-raid before nila patyon og naa na silay nakita, og naa man gani ilang duda,” said Amores. She speculated that Dumpit may have drawn the ire of someone but did not elaborate whether she thought it was personal conflict or work-related. “Dili man gyud ta maka-siguro nga naay nasuko nato, naay na-silo nato, mga ngana na sitwasyon,” she added. According to Amores, Dumpit left home early on Wednesday as he had been told that President Duterte would be in Bohol on the next day. He said he was needed at the Camp Francisco Dagohoy for a briefing. She said that almost immediately after Dumpit left, a sports utility vehicle sped pass their house and then she heard gunshots. “Ga haguros gyud tong Montero…either Montero or Fortuner, basta ngana na sakyanan. After ana, seconds lang, ga-buto-buto na didto,” said Amores. Amores was later told that Dumpit had been killed some 200 meters from their house in Barangay San Isidro, Tagbilaran City. Police and NBI officials have since maintained that Dumpit was subjected to a legitimate drug interdiction operation which was set in motion after placing the alleged “narco-cop” under surveillance starting June 19. NBI Bohol director Atty. Renan Oliva told media that there were pieces of information which indicated that Dumpit was involved in the illegal drug trade. He said that the reports were gathered by the NBI and various police units. “Na collate na nato ang mga information gikan sa CIDG Bohol, sa PNP regional office. 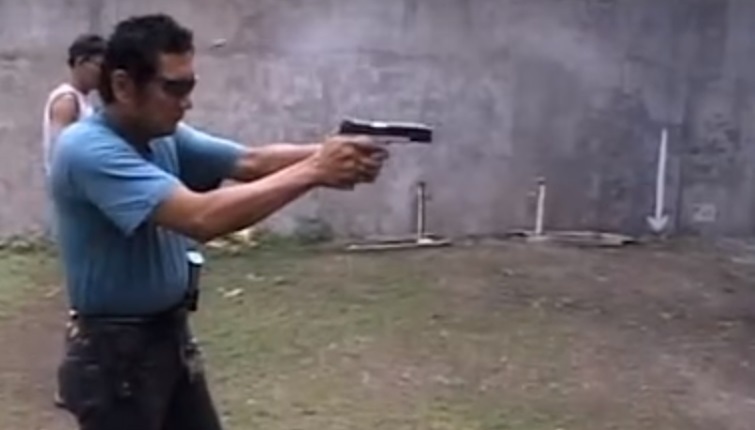 Naa na silay information nga ang subject [Dumpit] narco cop. Klaro g’yud na narco cop,” said Oliva. However, he noted that Dumpit may have made illegal drug connections while he was incarcerated at the Leyte Regional Penitentiary. “Sad to say, murag nag-sugod siguro ni siya kadtong pagka-detain niya sa Leyte. Although speculative, naka-connect siguro ni didto, maong na-apil siya ani,” he said. Dumpit spent a year at the LRP after four years of detention at the Cebu City Jail. He was transferred to the Leyte facility after he was convicted of a homicide charge in 2014 for killing robbery suspect Ronron Go in 2004. Oliva pointed out that Dumpit was worth more to them alive as he could have divulged information regarding his alleged drug network. However, Dumpit drew his firearm and engaged the lawmen in a gunfight during the drug interdiction operation on June 27, said Oliva. “Pag-ingon sa atong tropa nga ‘NBI, PNP ni,’ iyang gipa slide iyang motor sa daplin, unya mi-cover siya ug nipusil,” he added. Dumpit died on the spot as he succumbed to multiple gunshot wounds while operatives allegedly recovered from his possession 15 medium-sized sachets of shabu with a street value of P90,000 and a. 45 caliber pistol, which was not registered under his name.